Kameron Duncan is a 5-9, 187-pound Running Back from Ocala, FL. Very impressive list of offers, West Virginia, UNC, State, and Louisville among others. Looks like a great pick up and different style of back than Washington. Anyone know how Jacione Fugate has looked in practice. I know he is redshirting but he has great quickness and speed in his videos and I think he can be a threat in the return game too. The number one thing I have learned about football since we began is verbals mean nothing. My fingers are crossed though. The kid could always flip but this one is slightly less concerning to me. He already had plenty of P5 offers and it is fairly late in the year. A kid like Jaire Alexander used his commitment to Charlotte to garner bigger offers and jumped when they came around. Hard to wish a kid good luck when they pull that. [quote=“mojoniner, post:2, topic:30665”]Looks like a great pick up and different style of back than Washington. Anyone know how Jacione Fugate has looked in practice. I know he is redshirting but he has great quickness and speed in his videos and I think he can be a threat in the return game too. [/quote]Fugate is going to be a DB. [quote=“2k, post:5, topic:30665”][quote=“mojoniner, post:2, topic:30665”]Looks like a great pick up and different style of back than Washington. Okay thanks. Roster has him listed as RB. [quote=“mojoniner, post:6, topic:30665”][quote=“2k, post:5, topic:30665”][quote=“mojoniner, post:2, topic:30665”]Looks like a great pick up and different style of back than Washington. Okay thanks. Roster has him listed as RB. [/quote]NP, I only know that because he told me on Twitter he was going to be a DB. [quote=“2k, post:7, topic:30665”][quote=“mojoniner, post:6, topic:30665”][quote=“2k, post:5, topic:30665”][quote=“mojoniner, post:2, topic:30665”]Looks like a great pick up and different style of back than Washington. He looks fast on film and hits hard. Will he get a chance to be a return man? Really is going to be a solid class. I imagine that 6 or 7 more guys could still be added. Winning a couple games went a long way this season. Rivals currently has us with the 79th ranked recruiting class in the country. That is a huge step for us. Don’t think we have ever been higher than 110. That is terrible and hope for a solid recovery. 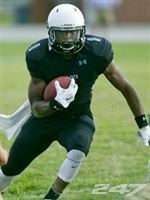 I wonder if that means our new RB signee Terrick Smalls definitely won’t get a redshit now since we will lack depth. This will basically b the redshirt year he didn’t get since we needed him last season. Hope he stays on the books and works hard on his rehab.